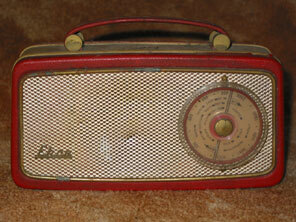 Lastly, to finish this Ekco sequence, here is one of the first Ekco transistor radios. Its actually quite common, but is nonetheless evocative of the late 1950's and early 1960's. The curved handle at the top is rigid, and is supported by brass circular drums. 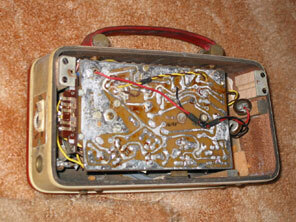 The case is formed from plywood and covered in pale "snakeskin" with red front and back panels. Tuning is effected by the large oversize perspex knob, a trend already popular in valve table receivers.